One Leaf is extremely proud to create custom made jewellery that truly embodies quality over quantity. 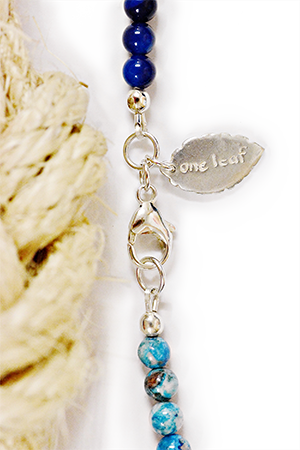 One Leaf sources premium materials from all over the world, including gemstones and fair trade supplies. Kat then crafts each design by hand, finishing every piece with 100% sterling silver. One aspect that sets One Leaf apart from other jewellers is Kat’s background in adventure and rescue. This has allowed Kat to create her own manufacturing niche. This has given her valuable knowledge in using durable materials along with robust knots to yield long-lasting high quality jewellery. The tying techniques she employs – although hidden in the finest material – ensure the weight of individual beads or stones are evenly distributed along the length of string. This means each piece isn’t reliant on the clasp or finishing join for its survival. Kat uses a superior finishing method that prevents strings wearing thin over time and ensures main jump rings are soldered closed, preventing them from opening or catching on anything. Meanwhile fine joining rings are of the highest ‘hard snap’ quality, ensuring a secure finish that will not open unless deliberately forced with a jeweller’s tool. Here at One Leaf we understand the importance of a sentimental piece and how devastating it can be when your favourite piece breaks. Kat also offers a repair service where this high quality finish can be adapted to your existing jewellery. If you have generations of pearls that require restringing or a clasp that has broken, please enquire today at info@oneleafdesigns.com and see if we can help. One Leaf Jewellery is made to last, nevertheless we still ask you to take care of your special piece. Please see how to care for your jewellery here. Kat personally checks all jewellery before it is sent to its new home. If for any reason it is faulty please see our return policy here.